6:16 AM Education News, Jobs In Nigeria, news, nigerian navy form, Nigerian Navy Recruitment, When Is Nigerian Navy Form Coming Out? Nigerians for enlistment into the Nigerian Navy through Direct Short Service Commission Course 23. 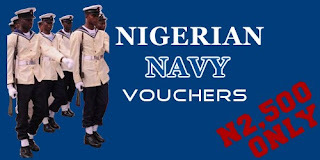 ONLINE NIGERIAN NAVY REGISTRATION STARTS ON 18 MAY 2015 AND CLOSES ON 28 JUNE 2015. You are advised to carefully read the Five (5) Steps below and the instructions on the Information page on this website. Step 1. Purchase Voucher: Purchase an e-voucher on this website using a bank debit (ATM) card of any Nigerian bank to obtain an access PIN at a sum of Two Thousand Five Hundred Naira (N2,500.00) only less transaction charges. Step 2. Applicant Registration: Enter your Voucher Serial Number and PIN in the text boxes in the Applicant Registration section on the right of this page. Then click the Register button to create an account. Step 3. If your PIN is valid, you will see the option to enter your Name and E-mail on the portal. Then click on the Sign-Up button to gain access to the e-Application form. Note: You will need your Serial Number and PIN to log in next time, so make sure you retain your voucher. Step 4. Complete the e-Application form. Make sure you review your data carefully before submitting. You will not be able to make changes after submission. Download and print a copy of your e-Application form. Step 5. Check this website from 6 July 2015 for a list of candidates shortlisted to participate in the Aptitude Test. The Aptitude Test will hold on Saturday 11 July 2015 at 8:00 am. To register, enter your Serial Number and PIN and click on the Register button. To log in, enter your Serial Number and PIN and click on the Login button. When Is Nigerian Navy Form Coming Out?